Often, those who truly make a difference never really set out to do so. They’re simply pursuing a dream, a passion. And yet, through sheer perseverance, innovation, dedication and a high dose of excellence, they somehow suddenly find themselves changing everything, revolutionizing an industry and inspiring a legion of followers. The search for marketplace information is never-ending. As the economy fluctuates, new technologies emerge and changing tastes shape sales, savvy industry professionals constantly look for indicators that will aid them in making business decisions based on more than mere supposition. While no one can accurately and consistently predict the course of things, knowing which way we’re going can confirm whether we’re facing a sunset or the dawn. You’re probably thinking, yeah, I know…a thousand words, right? Well, that certainly still holds true, but a picture is also worth hundreds, thousands, even tens of thousands of sales in today’s marketplace. SEMA has fielded many questions about the emissions certification process over the years, and we’ve learned a lot along the way. We’ve recently taken some important steps to help member companies create performance parts that both make power and comply with state and federal regulations. You’ll be glad to know that these services are now wrapped into a new facility. The SEMA Garage–Industry Innovations Center offers a range of tools and opportunities to help you develop high-quality products more quickly and effectively. If you are looking for information to understand the California Air Resources Board (CARB) Executive Order (EO) exemption program, both new and experienced members will benefit from our new “CARB EO Assistance.” For starters, we’ve collected all the information you need to know about the regulations and the EO exemption process in a user-friendly way. 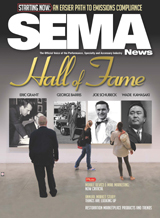 For a digestible overview, we suggest that you download a copy of the updated SEMA Black Book. It’s available free to SEMA members. We have expressed disappointment through this column over the years with the continued political gridlock in Washington. Partisan stalemate has created an adversarial climate on Capitol Hill for nearly every major legislative issue, from health care to entitlement reforms and everything in between. Both parties share the blame for a situation that renders it difficult for politicians to collaborate. For a decade, SEMA’s Political Action Committee (SEMA PAC) has been fighting for SEMA members and their businesses in the nation’s capital. Recently, SEMA decided to create a new position in the association devoted exclusively to growing the PAC’s influence. Experienced campaign veteran Christian Robinson was chosen to lead the PAC in the years ahead. SEMA News had a chance to catch up with the new SEMA PAC manager. We wanted to know who he is, how SEMA PAC works and why members should take notice. One of the greatest tools in the SEMA toolbox for member manufacturers is the new SEMA Garage-Industry Innovations Center. About a year ago, the SEMA Board of Directors met to discuss ways to help the association’s manufacturing members address various product development challenges. The SEMA Garage was born as a result of those discussions, and I was hired to lead this effort. Located in Diamond Bar, California, adjacent to SEMA headquarters, this 15,000-sq.-ft. facility houses a variety of tools and programs designed to help SEMA manufacturers more efficiently develop and market new products. The facility is comprised of four separate cells, each of which play a critical role in helping members get products to market in a quick and economical manner. SEMA continues its work to untangle a variety of emissions-compliance requirements while identifying and pursuing alternative paths to relieve or clarify concerns about navigating the regulatory landscape. At both the state and federal levels, the association is engaged in facilitating member compliance through a variety of programs and initiatives. This article summarizes issues that are either being addressed or have become more manageable as a result of these efforts. As the fight to defend our automotive pursuits continues, the necessity of showcasing the SEMA Action Network’s (SAN) efforts to the specialty-equipment industry remains critical. SEMA-member businesses represent an integral component in successfully reaching lawmakers in the United States and Canada with a unified message on important legislation. You, your colleagues and customers can help guide the course of the future. Each legislative session, the SAN tracks and responds to hundreds of legislative initiatives affecting the specialty-equipment industry and the consumers it serves. Some bills will not advance past introduction; others will go on to become the laws of tomorrow. SEMA-member information on how specialty-equipment parts are regulated by the government, health care law overview, California Air Resources Board (CARB) Executive Order (EO) instructions, intellectual property rights guide, links to small-business issues, off-road equipment and land use laws, etc. SEMA Action Network (SAN) is the industry’s outreach to the hobbyist community (your customers) and provides a nationwide partnership of car clubs, individuals and SEMA members working together to promote industry-friendly laws and regulations. With about three months to go until the kickoff of the 2013 SEMA Show, editors and reporters are increasingly looking for news from SEMA Show exhibitors. They want details about new-product debuts and vehicle reveals, and they will turn to the SEMA Show online media center for information. Exhibitors are invited and encouraged to submit their press releases. There is no charge to submit a release, and it will appear online for all reporters to access. Breaking news from SEMA member companies, including Yokohama Tire Corp., Sonoma Raceway, Goodguys Rod & Custom Association, Lund International Holding Co., and more. Doug Evans of Source Interlink Media has been voted chairman-elect of the SEMA Board of Directors and joins two newly elected Board members to help lead the association for the 2013–2015 term. Evans fills the position held for the past two years by Nate Shelton of B&M Automotive Group. Shelton began serving his term as chairman in July. The newly elected SEMA Board volunteers are Kyle Fickler of Weld Racing and Tim Watts of Superlift Suspension. Jeff Bates of Bob Cook Sales was re-elected to serve another term. More than 160 pre-vetted buyers from nine countries met with 41 SEMA-member exhibitors at the 2013 SEMA Middle East Business Development Conference. Buyers from the six Gulf Cooperation Council (GCC) countries (Bahrain, Kuwait, Oman, Qatar, Saudi Arabia and the United Arab Emirates [UAE]), from Lebanon, Egypt and Jordan traveled to the UAE to meet with manufacturers of parts for those engaged in car collecting, off-roading and motorsports and those seeking upgrades for street-performance vehicles. The restoration market is still embracing the class of vehicles commonly called “restomods.” It’s not a new phenomenon, but it has captured an ever-increasing share of the marketplace, melding stone-stock appearance with modern powertrain and convenience features. Full restoration also continues to thrive, of course. There is perennial demand for 100% original classic vehicles, and both ends of the spectrum seem to have gained momentum once more as the economy has picked up. On these pages, you’ll find a complete selection of the restoration products that were displayed in the New Products Showcase at the 2012 SEMA Show held last November. Leather Therapy, Velvet Cars, Lund International Inc., Design Engineering Inc., Sysonic USA, Rimblades Ltd. The proper tool makes life easier, but it can also make a job more enjoyable. Whether it’s a diagnostic machine or a ballpeen hammer, a ratchet wrench or an English wheel, a good tool can be a treasure to the person using it. A good tool invites use, inspires confidence and demands care. And just as with every other aspect of professional life, the tools and equipment used in the automotive world are subject to constant inventiveness, innovation and enhancement. Each year, new or improved industry equipment is introduced at the SEMA Show. The 2012 event held last November was replete with groundbreaking new creations, and we’ve brought them together in these pages for your convenience. Find one that makes your life easier. As the saying goes: “If you can dream it, you can build it.” Year after year, media and trade professionals from all over the world converge on the SEMA Show in Las Vegas to take in the elite of custom builds that showcase an array of specialty-equipment market parts and accessories. Frequently, these vehicles contain custom wheels and tires, exhausts, shocks and paints, which are all chosen with great care. In many cases, Show exhibitors are the ones producing the products that play a key role in these vehicles, giving them added exposure and notoriety. In addition to amazing vehicles that tantalize car enthusiasts the world over, the SEMA Show also attracts new and existing products from a wide array of manufacturers, drawing buyers and driving traffic to Show booths. Dean Jeffries, custom car painter, striper and builder, died in his sleep in early May. He was 80 years old. Jeffries was among the most talented of the men who shaped car culture in the ’50s and ’60s, though his profile was somewhat lower than that of George Barris, Ed Roth or Ken “Von Dutch” Howard. He may not have been as well known, but he was versatile and skilled enough that his handiwork could be found everywhere, from Gasoline Alley at Indianapolis to Hollywood movie and TV sets. Arguably his best-known TV cars are the two GTO convertibles he modified for “The Monkees” TV show in 1966. We dug through the Petersen vault and came up with these shots, taken in June 1966 after a grueling 10-day build of the first GTO.